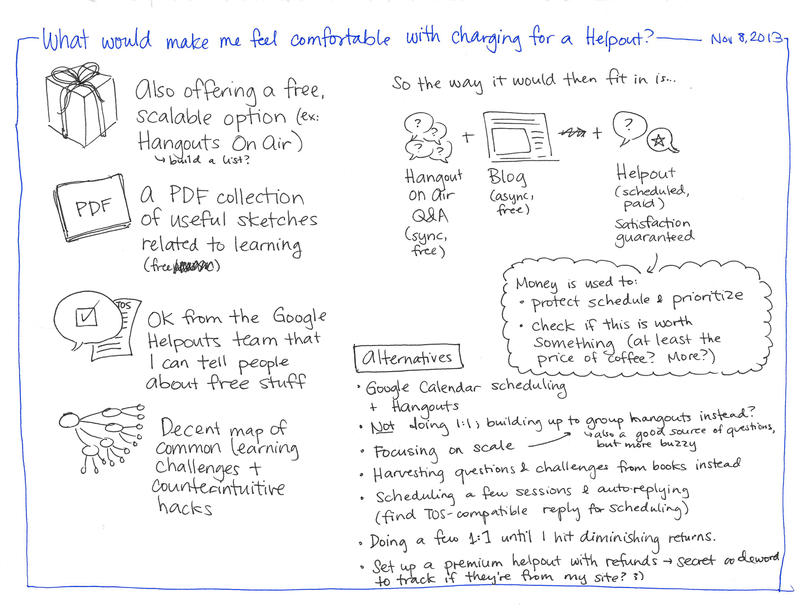 Google Helpouts Update: People like it, so how do we scale this up? 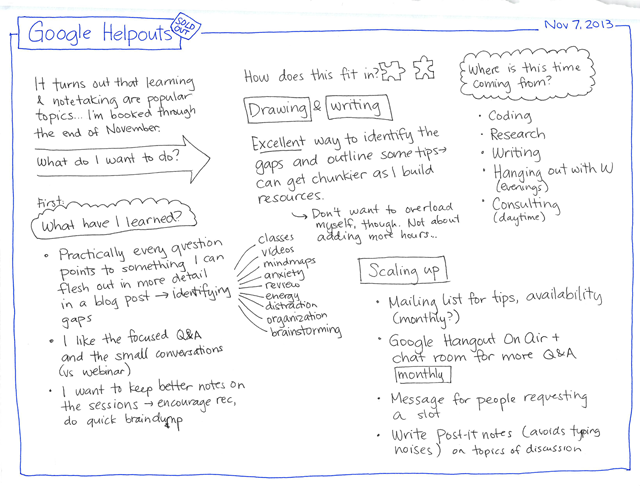 It turns out that the newly-launched Google Helpouts platform is a great way to offer quick, focused help to people. 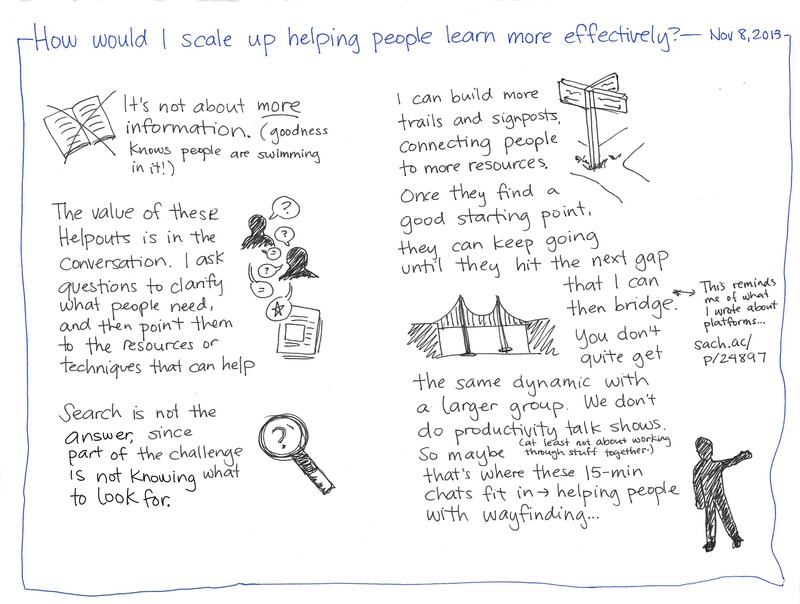 15 minutes is just enough time to ask a few questions to understand where people are coming from and share some tips and resources that can help them try out something new. My note-taking Helpout is fully booked for the rest of the slots I opened in November. I’m keeping it to 15-minute slots for two hours a day or every other day so that I don’t get overwhelmed. My two other listings (Emacs geekery and introvert hacking) just went live. I added a few slots for those so that I can test the idea out. You can find all three at sach.ac/help… but they’re probably going to be fully booked by the time most people check it out. Requests for more slots are piling up in my inbox, and I haven’t quite figured out what I’m going to do about them. I really really want to connect! People have all these fascinating questions, and I’ve gotten great conversations and drawing prompts out of these Google Helpouts. But I can’t let it take over my work or my life, so I need to find a better way to scale up that don’t involve just adding more hours. One way to increase my impact without increasing my hours is to reduce the no-show rate. 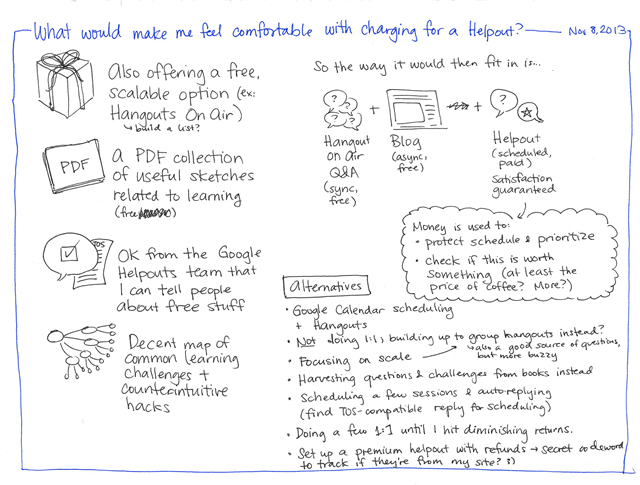 I think charging for a Helpout (even if I refund it on attendance) will drastically reduce my sign-up rate because people will need to set up a Google Wallet. I’m reluctant to introduce that kind of friction and effort when many of the people reaching out to me are blog readers (hi folks!) or students. I could be wrong about this assumption, so I should test it. Maybe charging will still result in sign-ups, in which case I may set the fee to a token amount (a cup of hot chocolate?) and inch it up until the slots reach equilibrium. I want to make sure that I’m overdelivering value and that I can still encourage people to contact me for free. I’ve started a discussion in the Helpouts community to find out whether my idea of directing people to free resources (Hangout on Air? Blog and mailing list?) that are outside the Helpouts platform is compatible with Google’s Terms of Service. Google doesn’t want Helpout providers to channel people off the platform and into non-Google-hosted paid services… Would they mind if I nudged people towards free resources if I’m out of scheduled slots? We’ll see. If I go this way, I also want a significant non-Google-Helpouts-marketplace way of encouraging people to sign up. That’s because most people browsing it will probably focus on the free offers (I would too! ), and I want to make sure that people who really want to talk to me can still find me. I could update the page about what I can help people with so that it lists different topics and options in a visually engaging way. 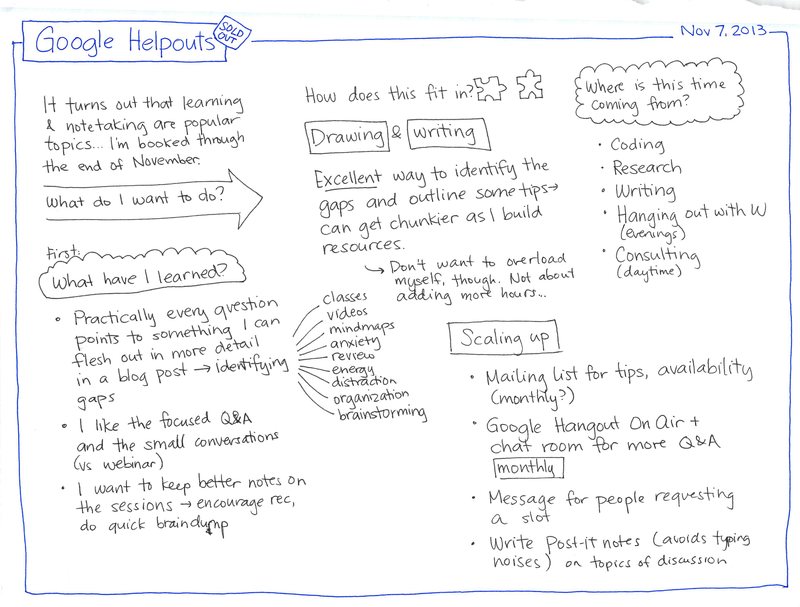 If my goal for doing these Helpouts is to collect interesting questions that I can use to share what I’m learning and fill in the navigational gaps, then it’s in my interest to ask questions beforehand, share some quick resources, and cancel Helpouts if people aren’t responsive or if those resources answer the question so that other people can take the slot. (Be firm, Sacha!) The Helpouts interface doesn’t make it easy to keep track of the age of messages, but maybe using Google Mail with Boomerang will do the trick. Most likely, people who are engaged will then have follow-up questions, so we can fill in the next gap along the trail. People don’t need more information. They need to figure out where to start. For me, the value I provide in the Helpout is in the back-and-forth of a quick conversation that clarifies what people need. That way, I can either point them to the right resources or give them some tips in case there are no such resources handy. (And then I can build those!) It’s a little difficult to do with a group session, although maybe if I get better at Q&A, I might be able to pull that off. Update the help page on my site and add different help options to it. Set up a mailing list for Hangout On Air, new Helpout availability, and new resources for different topics. Schedule a Hangout On Air experimental Q&A. Test conversion through my own page. Keep the session free. Be firmer about session preparation. Maybe give guidelines: three questions? Switch to a token fee with a cancellation policy, especially if I can update the listing or autorespond with include alternatives when fully booked. 2004: The talk was tons of fun!